Unbelievable, but the last show on tour in Sweden is already history. 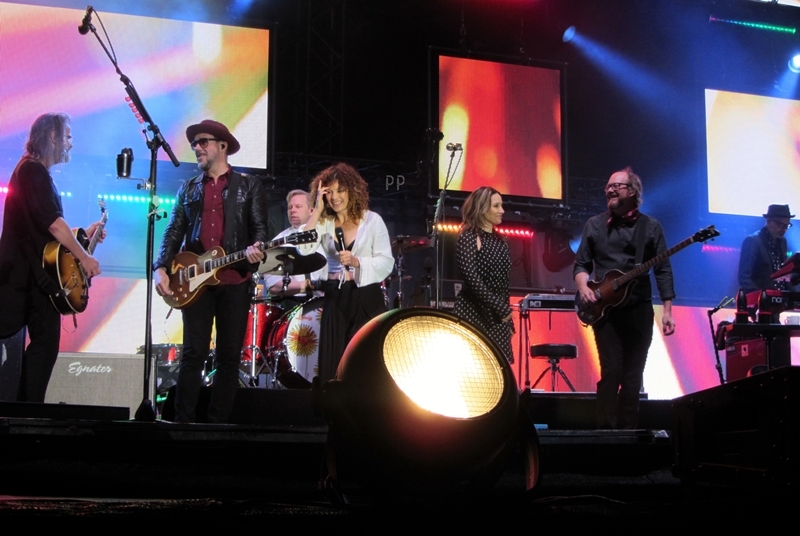 The 19th gig on 19th August in Eskilstuna was a blast despite the not too kind weather. We got a heavy shower for half an hour at 18:30. The crew had to cover the instruments and wipe off the water later. Strandels were lucky and by the time they came up on stage, it had stopped raining. It was still too cold though. Good Harvest were not that lucky. It got so windy that even the backdrop had to be held by crew members to keep it at one place, not that it hits the girls while they perform. Just at the time they came up on stage after 20:00, we got a heavy shower again. The girls and their guitars got soaking wet, but at half of their performance they said they saw the sun already and the rain would stop falling. And in some seconds it indeed stopped raining. So when it was PG’s turn, there was no more rain. Per mentioned in his first talk that this is the last show on tour (well at least in Sweden) and the audience was loud and cheering. When Per was talking about looking for a song which he hadn’t played live before now he said he found 470 such songs and he thought to play them all at the show. The crowd gave him a loud woohoo and applause. Oh, how we would have loved it… if he played all those songs! But of course, it was ”just” the usual intro to Honung och guld. And this time Mr. G asked Good Harvest again to join him on stage for the song. After it ended they hugged each other and the girls went off the stage. HERE you can watch my video recording of it (Per’s talk and the song). There were mosquitoes not only in Borgholm, but in Eskilstuna too. At least Per told the audience he had swallowed some and had to drink before he started the band presentation. In Borgholm it was Per’s nameday, in Eskilstuna it was Magnus’s nameday. Magnus asked Per if he knew what day it was, Per said it was Saturday. Then Magnus said no, it’s Magnus nameday and he thought to ask for a little tribute for himself. He said he would say something what the crowd should repeat after him. He would be happy if we did so. The text was: ”Happy nameday, Magnus! Among all who are standing on the stage now we love YOU the most!” He was really happy about it and thanked the crowd for being so kind. Everyone laughed. Per only said: ”What a fantastic personality!” Haha. HERE you can watch my video recording of the whole band presentation. Playing for the last time in Sweden, the band was really tight. 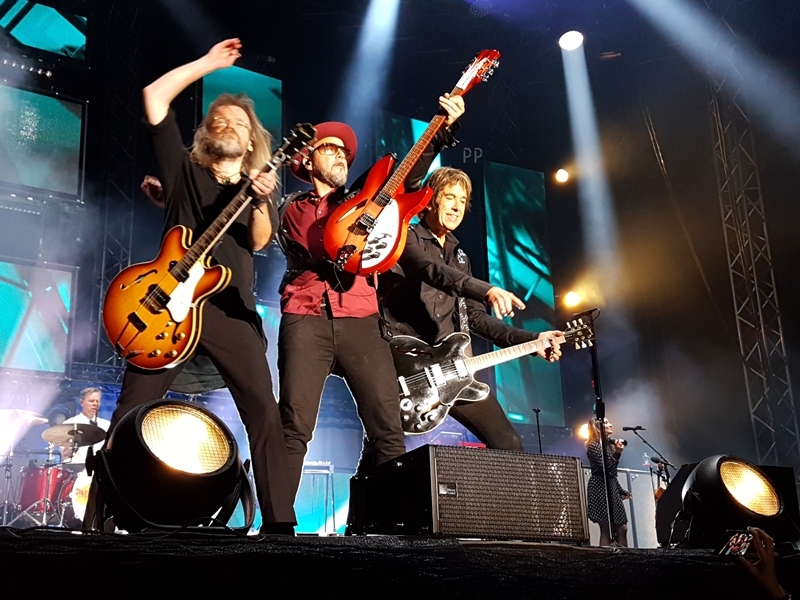 I wouldn’t say they were the same energetic as in Uppsala, but certainly you could feel the show was a special one for everyone. The Look was a highlight for sure. And Ljudet av ett annat hjärta and Sommartider. After Sommartider the crowd didn’t want to stop clapping and shouting. Per thanked the audience for coming and being so amazing. 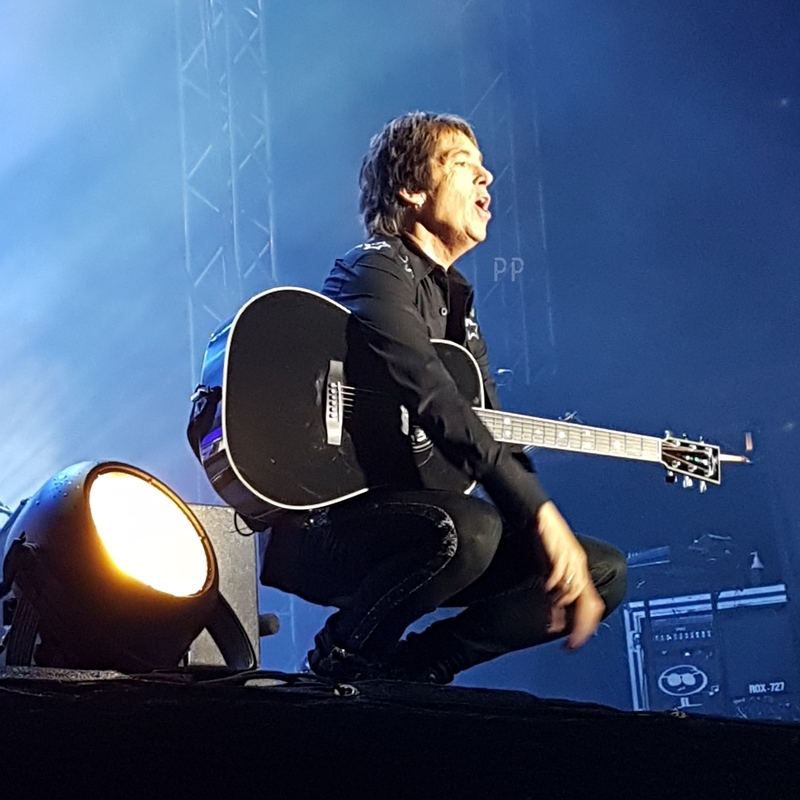 He used the occasion to thank Good Harvest and Strandels for being a great support for him during the whole tour in Sweden, they did a fantastic job. Then he went on with Småstadsprat to close the concert. 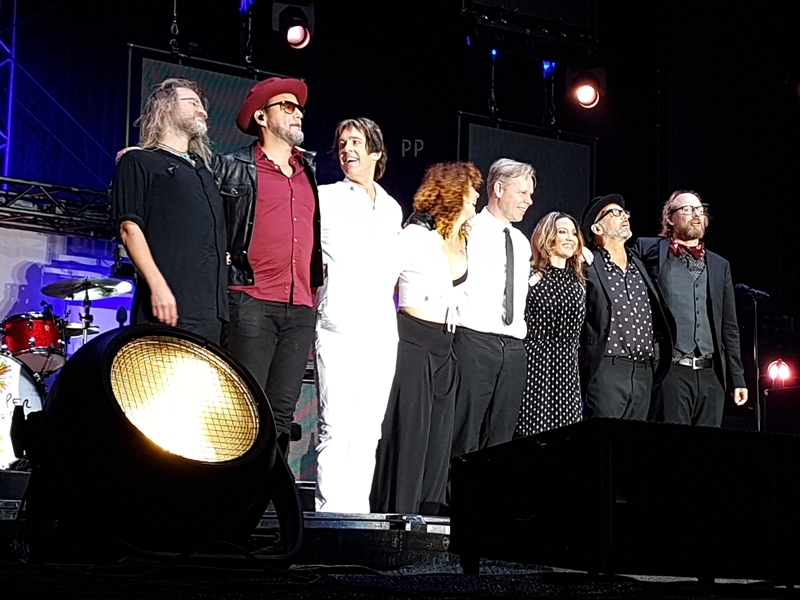 When the show ended, Per pointed at the band to made the audience applaud for them, then they took a bow. 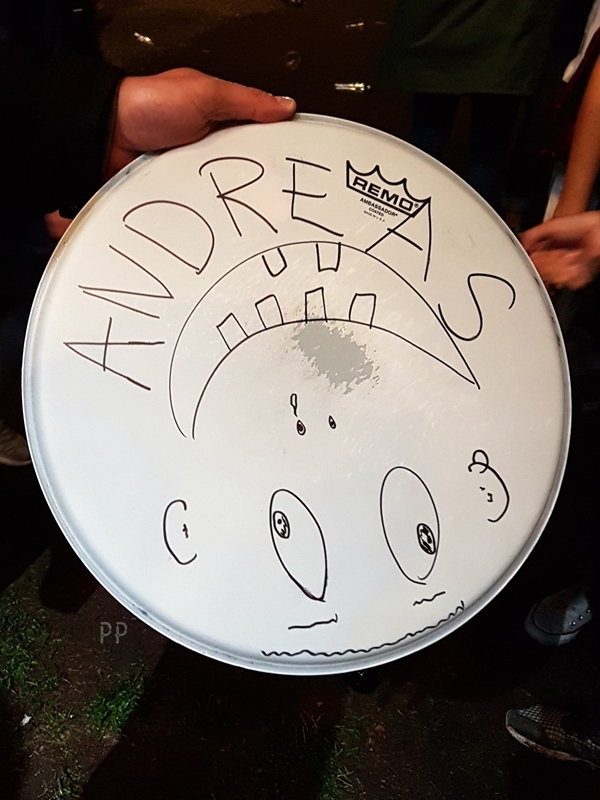 Before they went off the stage, Andreas threw a drumskin to the crowd. I met the guy who caught it and could take a pic of it. See the photo what Andreas drew on it. Haha. While Per was walking off the stage, he pointed at the fans in the front rows, thanks for coming. It was lovely! 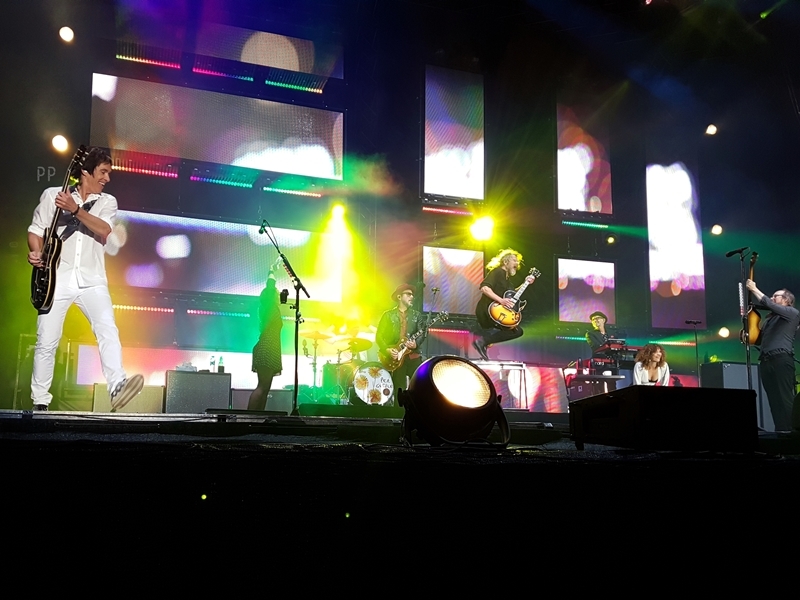 Aw… the last show in Sweden. Impossible that this tour is really coming to an end. It’s always so hard to accept it. OK, 2 more shows in Finland. It would have been nice to end the tour in Sweden though. BYE BYE SWEDEN. Oj, det gick fort. “En vacker kväll”-turne’n (för Sveriges del) är över. Fantastisk final vid slottet i Eskilstuna igår. En av de allra bästa giggen if u ask me, avslappnat och gungigt. Helena, Malin-My och bandet satt ihop precis så där bra som man gör när man spelat ihop ett tag. T o m “The Look” lät extra tung!!!! Och “Småstadsprat” har verkligen träffat folk mitt i hjärtat, jag har märkt det undan för undan under turne’ns gång. Man blir stolt. Good Harvest lät som en dröm i “Honung och guld” för andra kvällen i rad. Thank you, ladies! Och vilken mäktig och stor publik som kom. Lyssnande, spejande men sugen på hyss hela tiden. En grym final. Vill passa på att tacka alla underbara människor som kommit till konserterna under sommaren. Alla åldrar har synts till. Alla med olika och personliga relationer till mina låtar. Vi har filmat här och där så det kommer att bli ett härligt minne framåt jul + Anders Roos har plåtat alldeles för mycket så det dyker säkert upp en vass fotobok så småningom. Funderar också på att göra en live LP-platta. De här bandet låter så speciellt och den här turne’n är helt unik, det vore kul att föreviga. Vi har spelat in alla konserter så det finns många golden moments att välja på. Christoffer, har du tid? An extra special thank you to all our international adorable friends who stood by our side (front row) at so many shows. You mean so much more to us than you can imagine. Lots of love from all of us! Två gigs i Finland kvar, sen är det new balls. Ha en härlig vecka. Snart kommer hösten. /P. So adorable! I love that he never forgets about the fans and this extra special thank you to all the international fans (FRIENDS!) is so heart-warming. It means so much to all who came from the different corners of the world. So, we can’t wait to have the concert film, the photo book and if Chris has enough time, a live LP! Fingers crossed!